You DO know where those word come from, don't you? Probably you do, but in case you're interested in learning much more detail about our founding documents, I have a wonderful suggestion. I'd like to re-welcome the continued advertising by Bruce Gordon for his book Self Evident Truth. Before we accepted his ad a few months ago, we requested to read the book (since we don't accept ads for products we cannot enthusiastically endorse) and we were blown away by the research and depth within those pages. I am not exaggerating when I say I use this book almost daily. It has become the foundation for our homeschool civics lessons. Our girls have a much better understanding of the Declaration of Independence now, and we're just about to begin working on the Constitution. This book has become a valuable resource on our bookshelves. I'm pleased to have Mr. Gordon as a continuing advertiser and urge you to consider adding his book to your own bookshelf. THANK YOU!! I so appreciate your endorsement of my book. Thank you so much! Tired of that liberal at work telling you the Founding Fathers were "deists" and not Christians? Sick of hearing your SIL talk about the Constitution and the separation of church and state? Well get this book and you'll have the support you need to shut them up. Our Founding Fathers were Christians. Our Constitution doesn't mention "separation of church and state." And the progressives have no idea what they're talking about. Read the book, then you can educate the idiots in your life. Is this book still available? When I followed the link it said it wasn't and I couldn't find it on e-bay. I haven't tried Amazon yet. Missy, let me email the author and inquire. Thank you for asking, Missy. 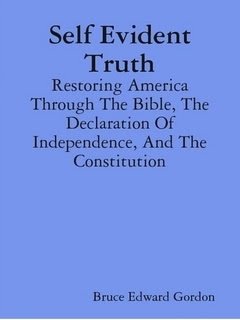 The book is still available at SelfEvidentTruth1776.com and at Lulu.com. If you click on my name above it will link you to the book. You might also be interested in my newest book, "The Life of Jesus Christ: Promised Messiah, Servant of God, Son of Man, Son of God." It can also be found at SelfEvidentTruth1776.com. I took all of the events from the four books of the King James Version of the Gospel and arranged them in chronological order. Then I simplified the language and put it in chapter form so that it would read like a story book. When you go to SelfEvidentTruth1776.com just click on the link on the left sidebar for a full description of the new book about the life of Jesus. Thank you so much for your interest, and thank you Patrice for your efforts!